The joy and enthusiasm seen within the local community around the access path on Pambula Beach will ensure that Council’s trial pushes on despite the setback presented by this week’s huge seas. The path had been in place since early May but faced its greatest challenge last weekend with 21 metre swells reported off the Sapphire Coast. 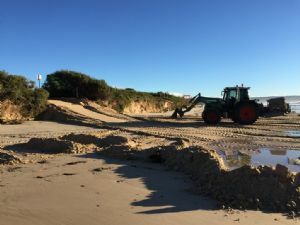 As the weather system built late last week, Council staff removed sections of the path from the beach, which is one of the designs real strengths, but the storm impact was greater than anticipated. John Grady, Leisure Services Manager said 28 metres of pathway was secure at Council’s Merimbula Depot and at Pambula Beach, but unfortunately the surging sea claimed around 40 metres of pathway. “This is all part of the trial and will really inform the trial’s future progress,” Mr Grady said. The path-way gets people with mobility issues over the soft sand of the beach, opening opportunities for all sorts of beach and water activities. Bega Valley Shire Council is not aware of any other NSW council trialling such a pathway, but many are expected to follow and learn from the Bega Valley Shire trial. “People with a disability have spoken of being able to swim in the ocean for the first time in many years,” Mr Grady said. Council is currently salvaging sections of the pathway from storm debris, and is keen to hear from members of the public who might find sections of the recycled plastic panels.